This guidance document has been created for the Baltic Sea Region, which would specifically target the impacts of offshore wind farms on biodiversity in the more Northern parts of the Baltic Sea (marine areas of Sweden, Finland, Estonia and Latvia)..
What current research findings on environmental impact assessments for offshore wind energy are valid for the Baltic Sea and what are the missing knowledge gaps? Very comprehensive and high quality environmental impact studies must be performed before installation of any offshore wind farm to avoid negative impacts on the environment. A number of documents are already available providing more general or detailed guidance directions on how to perform such studies. There was a need to put them in a Baltic Sea context. Prepare a guidance document for the Baltic Sea Region, which would specifically target the impacts of offshore wind farms on biodiversity in the more Northern parts of the Baltic Sea (marine areas of Sweden, Finland, Estonia and Latvia). Outline the general requirements for environmental impact assessment for offshore wind farms in the Baltic Sea based on the state of the art knowledge – what is the objective of such study, which parameters have to be measured for different features of the marine ecosystem, when and how frequently the investigations have to be performed. Serving as a supporting document for developers, consultants, marine experts and competent authorities dealing with the assessment of environmental impacts for development plans in the marine environment. On 21-22 May 2013 in Riga, the international seminar on “Environmental Impact Assessment of offshore wind farms and other large marine infrastructure” gathered more than 40 OWF experts from various organisations (state institutions, developers, scientists, non-governmental organisations) of the Baltic Sea and North Sea Regions. The outcomes of the seminar were largely used for the development of the Guidelines. 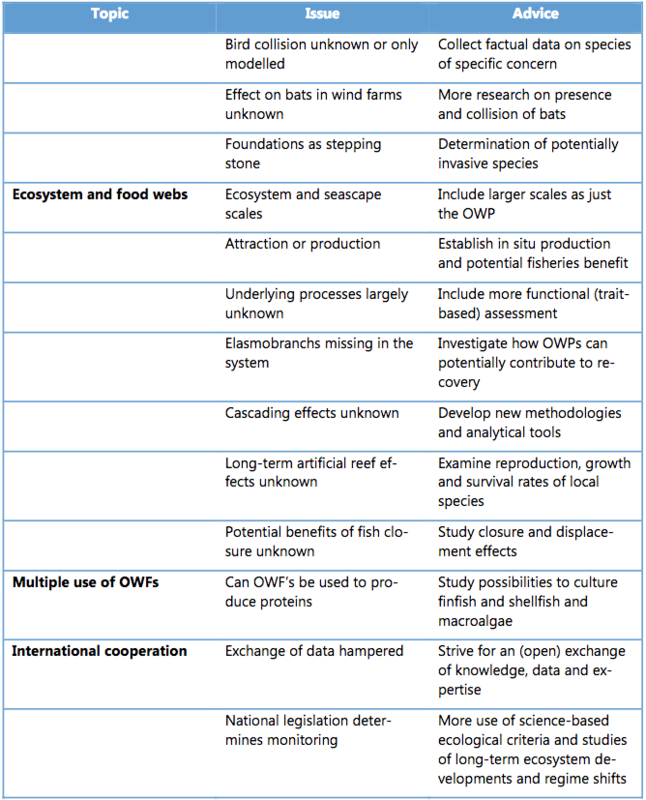 A minimum set of requirements by the local legal system usually does not cover the full range of potential impacts: at current date we have a good knowledge on many of the general short-term effects on the marine system, however, we are far from fully understanding the ecological significance of the effects and only just beginning to consider the knowledge requirements for long-term changes. There is a strong development of concepts for adequate coverage of topics and development of cost-effective approaches to the assessment of the effects caused by installation of windfarm projects. The case of the Baltic Sea, however, is a very good example of missing knowledge and experiences: the specific conditions of the Northern waters with its particular aspects of low salinity and winter ice call for additional studies and changes in monitoring strategy. Several suggestions of considering these new aspects in designing baseline or monitoring studies have been made, e.g. by Lindeboom et al. 2015 (Table 9). Lindeboom, H., Degraer, S., Dannheim, J., Gill, A. and Wilhelmsson, D. 2015. 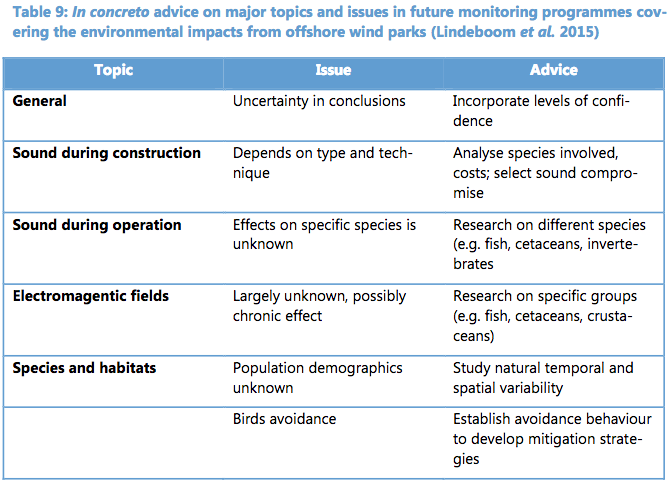 Off-shore Wind Park Monitoring Programmes, Lessons Learned and Recommendations for the Future. Hydrobiologia, 756, 169-180. The Guidelines do not provide a very detailed description of methodologies for environmental impact investigations – the exact methodologies have to be chosen depending on the conditions of the particular project area. The guidelines are produced in the frame of the LIFE+ Nature & Biodiversity project “Innovative approaches for marine biodiversity monitoring and assessment of conservation status of nature values in the Baltic Sea” (MARMONI).